In September of 1900, Galveston was struck by what remains the worst hurricane in the nation’s history. The old coastal town was devastated. More than 6000 people died. Then, in February of 1901 there was a big prizefight. In the words of an old Galvestonian who was there. . . When I was just startin’ out a long time ago, God blessed me by the way of a regular job. Happened to be with law enforcement, if you could call it that. I guess you could say I was still too green to know much better back in 1901. But study on it, I did. An’ I learned a whole lot from two young men you’d be right hard-pressed to ever believe these days. One was a Jewish boy from out San Francisco way, name of Joe Choynski. (Almost to himself.) Yes, sir, Mr. Joe Choynski. . . now you might’ve heard of him, ‘cause Joe was already right famous back then as a big-time, professional prizefighter. . . sort of like what a movie star is today, or maybe a big-time baseball player. Joe had himself a couple of right colorful nicknames, like the fighters’ names, you know. “The California Terror,” some called him, ‘cause the boy could fight like the devil— an’ also ‘cause he was from California, of course. Then some called him “Chrysanthemum Joe.” So you can see, he was a real colorful fellow, like. Just about everybody who knew him called him “Little Joe,” ‘cause everybody just plain liked him—an’ because even though he fought all those famous big heavyweights, he never weighed more’n about 170 pounds himself. Fought ‘em all he did, most of ‘em before he ever got here, an’ he didn’t care a hang what color anybody was. I called him Mr. Choynski. He was one rare fella, an’ away ahead of his time. The other man was a big colored boy, come from right here in Galveston. A real heavyweight, big and strong, and real full-size. John Arthur Johnson was his name. Around Galveston, we just called him “L’il Arthur.” But I’m quite certain you’re likely to have heard about him by another handle: name of Jack Johnson. That’s right—big, bad ol’ Jack Johnson himself. They called him “The Galveston Giant,” an’ he was the first black Heavyweight Champion of the World. Of course, if you listen’d to most people back then, he was also “the scourge of the whole White Race.” But back in ‘01 Jack was already a good fighter, but just a pup, 22 or 23 years-old, and just plain ol’ L’il Arthur from Galveston. Now, these two boys got together down here for a big boxin’ shebang, an’ it all happened just a few months after the Great Hurricane of 1900. I reckon most all of you people remember that one. A pure nightmare, as sure as I live and breathe. (He pauses before continuing.) In just a couple of hours late one September night, the whole of Galveston Island was near about swallowed up, an’ blown right off the map into the Gulf of Mexico. More’n 6000 people drowned, and 3600 buildings washed away like so much driftwood. . . anyways, between that ol’ hurricane and those two young fighters, one still right green, and the other a real slick and seasoned professional, well, I mean to tell you, nothin’ around these parts was ever jus’ quite the same. No, sir. But you know, it’s funny now. . . seems these days I find myself goin’ back, and thinkin’ about the thing more and more. . . 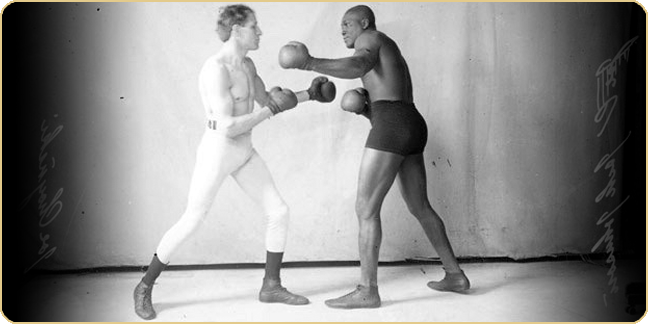 The fight went into the record books as Jack Johnson’s first loss; but both men were arrested immediately afterwards as participants in a “mixed race” fight, then illegal in Texas. They spent a month together in the Galveston Jail. This is what the play is all about.